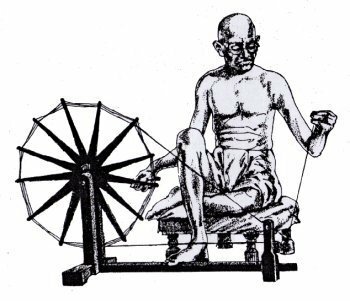 Khadi is a homespun cotton fabric introduced to India by Mahatma Gandhi. When I travelled in India with my husband around 1980, the first thing to do was to get a tailormade khadi suit for both of us. Thus with my short hair I was safe everywhere as the younger brother of Bernd. I still cherish my khadi suit here in Japan and wear the vest in wintertimes. When I first discovered the spinning wheel it was purely through intuition. It was not backed by knowledge so much so that I confused charkha with kargha (handloom). The importance of how he dressed was very closely related to Gandhi's vision not only of the means Indians should use to achieve independence but also of the type of nation India should become. Central to that vision was home-spun cloth known as khadi. Khadi would make Indians self-sufficient and would eventually result in swaraj or self-rule. is a National Holiday celebrated in India to mark the occasion of the birthday of Mohandas Gandhi, the "Father of the Nation." He was born on October 2, 1869. Hence Gandhi Jayanti is celebrated every year on 2 October. It is one of the three official declared National Holidays of India and is observed in all Indian states and union territories. The United Nations General Assembly announced on 15 June 2007 that it adopted a resolution which declared that the 2nd of October will be celebrated as the International Day of Non-Violence. Indians have been marking the 133rd birth anniversary of one of their most revered leaders, Mahatma Gandhi, who fought against British colonial rule through non-violent means. it is the age of IT"
at heart, not in mind. A celebration takes place every year in our Gardens before Gandhi's statute on this day. On this day in 1948 Gandhi ji was shot from a point blank range by Nathuram Godse just after the Friday prayer meeting in Delhi. This day is observed as Martyr's Day. That was the end of the physical body and not the end of his universal teaching of love and non-violence; in fact that the beginning of a storm to sweep off the wrong doings, eradicate illiteracy, social inequality, oppression of he rich and to usher freedom across the world. Gandhi has influenced millions across all the continents by his principles of non-violence, peace, brotherhood, love and forgiveness. Late Nelson Mandela, Desmund Tutu, Martin Luther King jr and many world leaders are his followers. Barack Obama, the US President, is a great admirer of Gandhi. On his birth Centenary in 1969 late Frank Moraes, the editor of Indian Express, in the Spotlight of All India Radio had said, 'After Jesus in the world history and Buddha in Indian history comes Mahatma Gandhi for his principles of non-violence and peace...'. Frank Moraes was right. Gandhi was a phenomenon. He shall never die, no bullet can pierce him, no fire can burn him and no flood can drown him. The light he has lit shall burn ever brighter. On this Martyr's Day let us pray for peace and non-violence to prevail and our world be prosperous and war-free. May human values soar high!! October 2nd was the 136th Gandhi Jayanti, the celebration of Gandhi’s birthday. these Gandhi Jayanti Greeting Cards .Send Gandhi Jayanti Greetings Absolutely free...!!! Actually, way back in 1986, the Filipinos applied his approach of non-violence when we ousted the dictator Marcos. Only 1 life was lost in the 4 days when we walked the streets. It felt so good to 'fight' for freedom that way! Truly memorable.